TROY, Mich. — Delphi Automotive revealed at its AAPEX press conference the winner of its year long sweepstakes giveaway, "Win the Delphi Dream Shop." 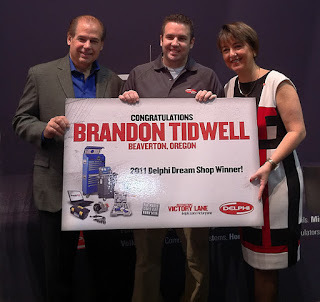 The winner, Brandon Tidwell of Beaverton, Oregon, a technician from Everett Street Autoworks in Portland, Oregon, will receive Delphi parts, tools, equipment and training to help him open his own shop or upgrade his current shop to a Delphi Dream Shop. The prize is part of Delphi's third-annual Destination: Victory Lane promotion. Due to the popularity of the "Win the Delphi Dream Shop" giveaway, the promotion will run again in 2012 starting in February. "I am really stunned that I won," said Brandon Tidwell. "As a technician, all of the new tools, high tech equipment and training that I receive will be a big help." Brandon and his wife, Eimy, were flown to Las Vegas for the November 1, 2011 announcement compliments of Delphi, receiving three days and two nights at the Venetian. Pictured in the image above, WORLDPAC's Mario Recchia presents Brandon and Eimy Tidwell with the prize. The sweepstakes drawing took place on October 17, 2011. 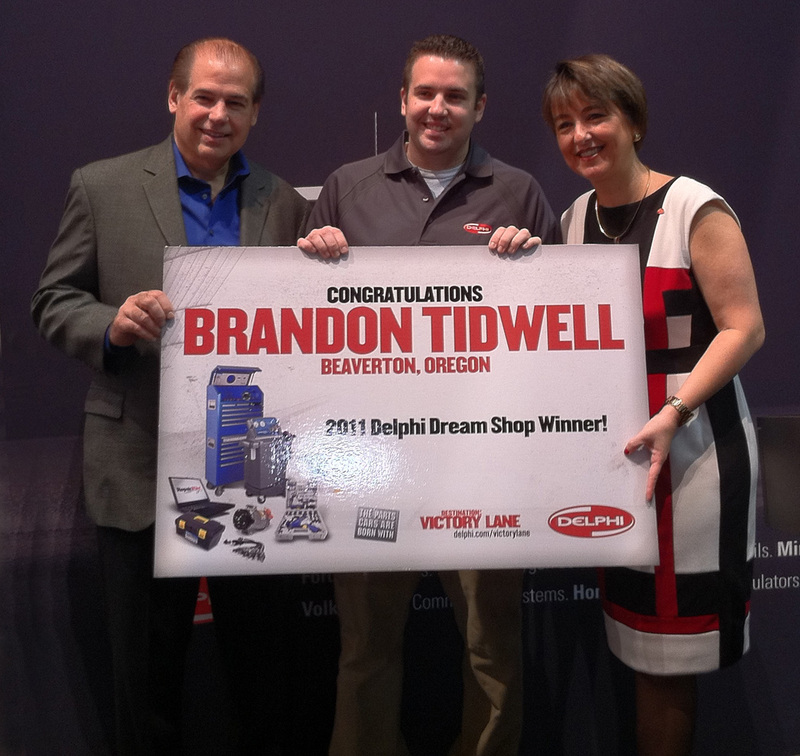 Brandon entered Delphi's "Win the Delphi Dream Shop" sweepstakes after viewing it on a promotional panel within WORLDPAC's speedDIAL e-catalog and ordering software. SpeedDIAL's promotional panels highlight various WORLDPAC suppliers on a rotating basis. By clicking on Delphi's featured "Dream Shop" themed promotional panel (see image below), Brandon was linked to Delphi's sweepstakes web page where he registered for and ultimately won the Delphi Dream Shop! The Delphi Dream Shop giveaway includes equipment needed to service today's vehicle electronics reality such as a high-performance laptop with shop management software, A/C recovery machine, diagnostic tool pro scanner, diagnostics software, OBDII/CAN hand-held reader and fuel system tester. Other items include a lift to 11,000 pound capacity, transmission jack, compressor and air tools, two-ton service jack, engine lift, tire changer and balancer, battery charger and tester, and brake lathe. Delphi will also provide comprehensive training, as well as a subscription to Delphi's RepairPoint for further online diagnostic support and parts from its fuel, engine management, heating and cooling, and diesel product portfolio. "Providing a technician with everything they need to make their dream shop come true has been a very positive experience," said Carrie Wright, global brand and communications director, Delphi Product & Service Solutions. "As a tier one OE supplier, we’ve always put focus on helping technicians be prepared for the vehicle electronics revolution so they can succeed. The "Win a Delphi Dream Shop" promotion was a natural extension of that focus." In addition to the Dream Shop grand prize, technicians that signed up at delphi.com/victorylane have had the chance to win monthly, weekly and instant prizes including 42" HD TVs, fender covers, technician gloves, BassPro gift cards, Delphi merchandise and more. This will continue through the end of 2011. And they can continue to follow Delphi-sponsored Hendrick Motorsports race teams all while learning about Delphi's all makes plan for its engine management, fuel management, and heating and cooling products. WORLDPAC imports and distributes OE and quality aftermarket replacement parts to independent import and domestic service centers in the US, Canada and Puerto Rico. SpeedDIAL, WORLDPAC’s exclusive online catalog and fulfillment ordering software, contains more than 7,000,000 import and domestic multiple brand applications for virtually every automotive make and model. The company also offers extensive customer services such as their highly praised WORLDPAC Training Institute (WTI) and targeted customer marketing solutions.